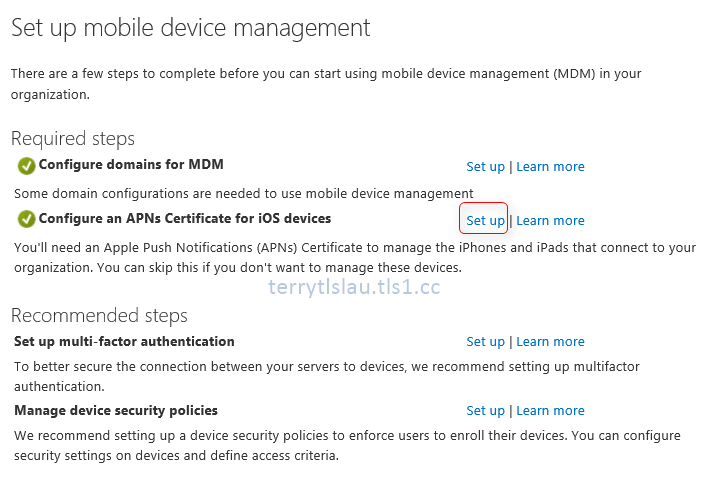 Apple Push Notification Service (APNs) certificate is used to manage Apple Devices by every Mobile Device Management platform. it expires every year. 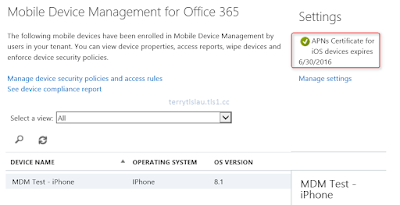 When the APNs certificate expired, administrators cannot manage enrolled mobile devices on MDM portal. To renew APNs certificate, the steps are similar to request a new APNs certificate. 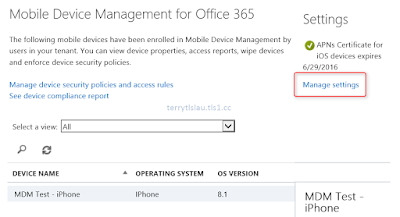 In this blog post, I'm going to renew my non-expired APNs certificate on MDM of Office 365. 2. 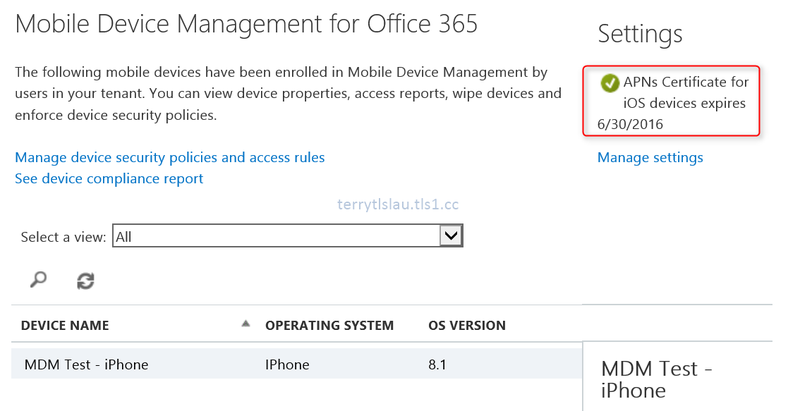 On left pane, select "Mobile Devices" tab. 3. Next to "Settings", click "Manage settings". 4. 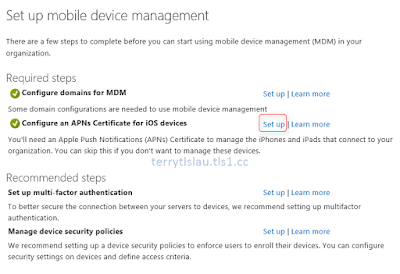 On "Set up mobile device management" window, next to "Configure an APNs Certificate for iOS devices", click "Set up". 5. On "download certificate signing request" page, click "Download your CSR file" to download and save the file. 6. On "create an apns certificate" page, click "Apple APNs Portal". 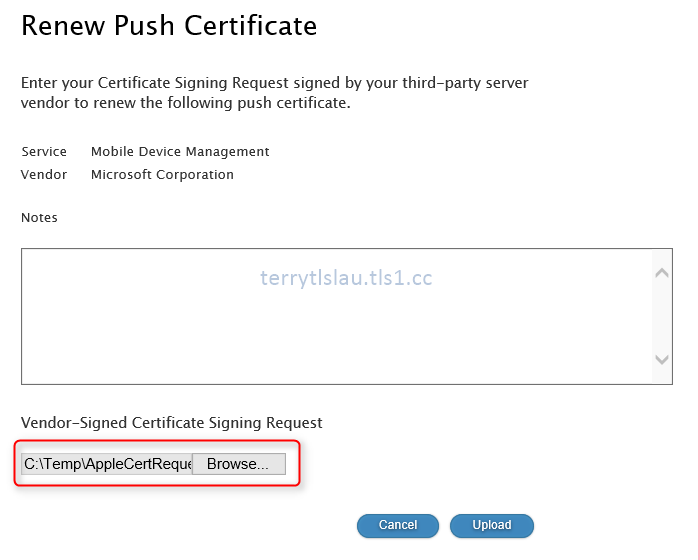 Then, log in Apple Push Certificates Portal. 7. Click "Renew" on Certificates for Third-Party Servers" page. 8. On "Renew Push Certificate" page, click "Browse" to select the CSR file which downloaded from Office 365 web page. 10. 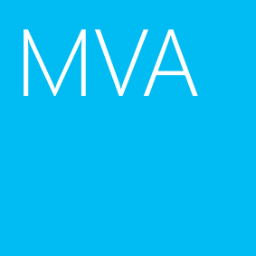 Click "Download" on Certificates for Third-Party Servers" page to save .pem file. 11. Back to "upload apns certificate" page, click "Browse" to upload .pem file. 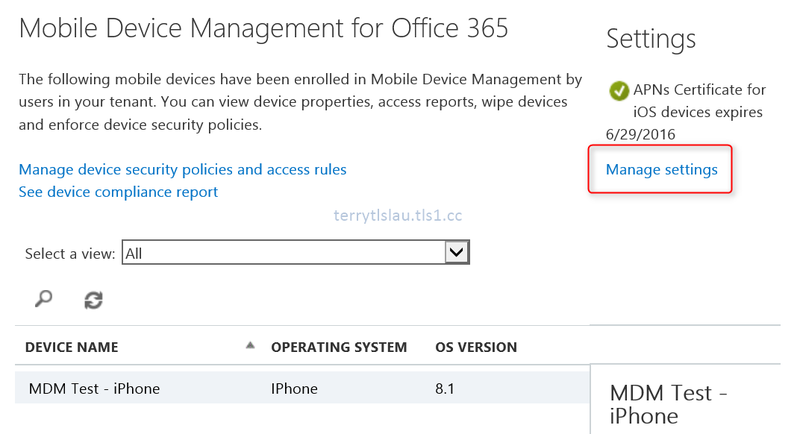 As a result, the APNs certificate has been renewed on MDM of Office 365.